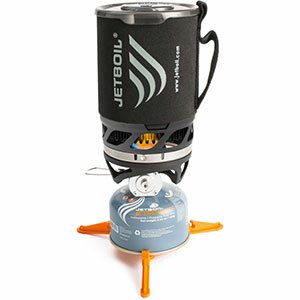 An exceptionally light, efficient canister stove, that’s nearly perfect for three season by one or two hikers. Keep it out of the wind, and it will bring water to a boil quickly, or simmer nicely. Monatauk seems to be out of business, but other companies market the same stove under their name. 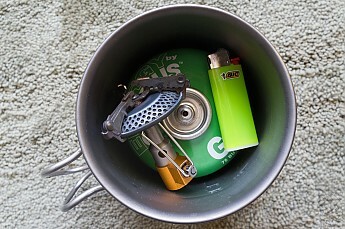 As I was outfitting myself for hiking the Appalachian Trail in 2011, the Monatauk Gnat had made a big splash as the “World’s Lightest" canister stove. At 48 grams, that claim has since been surpassed, but that, and generally positive reviews in backpackinglight had me pushing the button. I had considered other options. 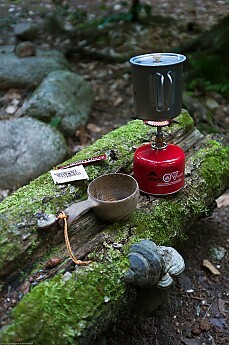 I have an alcohol stove I like, but I was starting in March, and was concerned about low temperature performance. I also figured out that the amount of fuel I’d have to carry between resupply points outweighed a small canister. I also have an MSR Whisperlite, but I didn’t expect it to get that cold, and I was looking to minimize weight on my 57 y.o. back! I carried the Gnat on the AT for 644 miles in 2012, and 674 miles in 2013. I’m a slow hiker, so that’s more days than you might think … I generally cooked both breakfast and dinner, along with the occasional midday cup of coffee. Never had a clog, or any other performance issue. Cold WX Performance: I've used it for coffee and oatmeal on several below freezing mornings. Never had a problem boiling water, but I can’t honesty talk to really low temperature performance. Wind is another matter. The Gnat does not like wind. Even light breezes seriously affect the flame. I got pretty good at finding natural wind breaks, or creating them … I never missed a meal because of wind, but that might speak to campsite selection more than stove performance. Sound: Quieter than my old Svea. Noisier than my alcohol stove. I don’t have a db meter, but I’d say it’s pretty quiet. It’s not noisy enough to annoy me. Simmering: I like cooking, and I carry stuff that tends to require relatively-long simmers. Stuff like dehydrated vegetables, quinoa, lentils ... 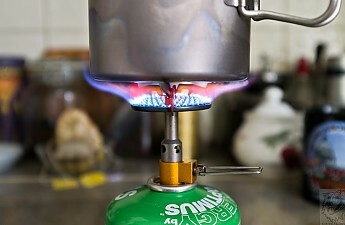 The Gnat's valve provides for smooth control to the flame, and I was able to reduce its output to where the contents of my pot simmered for as long as I wanted. 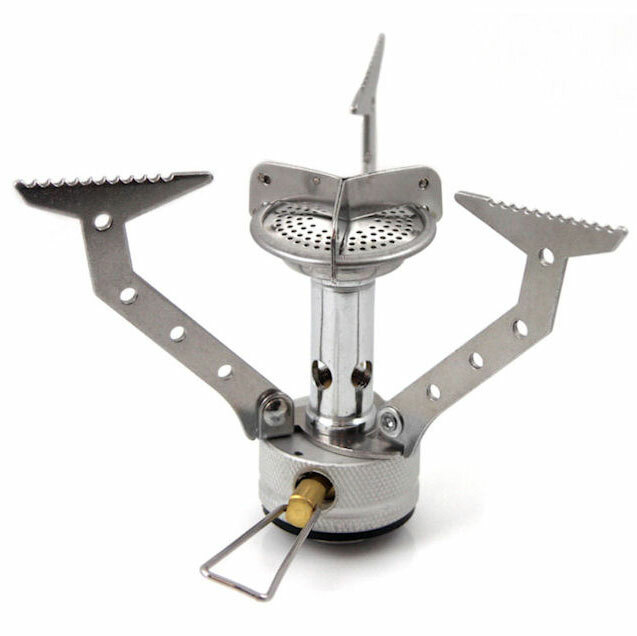 Titanium is used for the pot support legs, burner top and gas tube. The valve body is aluminum. That big head is a covered with a wire mesh, which both helps prevents backflash, and separates the flame into an array of smaller flames for a hotter, better-distributed flame. Pot supports fold up and on top of the burner head. They are serrated and provide fair grip to a pot. Some complain that the pivot point is a bit sloppy, but I don’t see that it affects performance in any way. The Gnat comes with a nice, molded plastic case that has undoubtedly migrated to the bottom of one of my equipment tubs. I place it in a small nylon bag, that doubles as the rock bag in my bear-bagging system. It, and a 4 oz canister fits in my pot. That big head makes for a nice flame, but it also makes the stove a tight fit in my Snow Peak Trek 700 pot with a canister in it, and the cover on. Good for me, but it may not fit in a shorter pot. 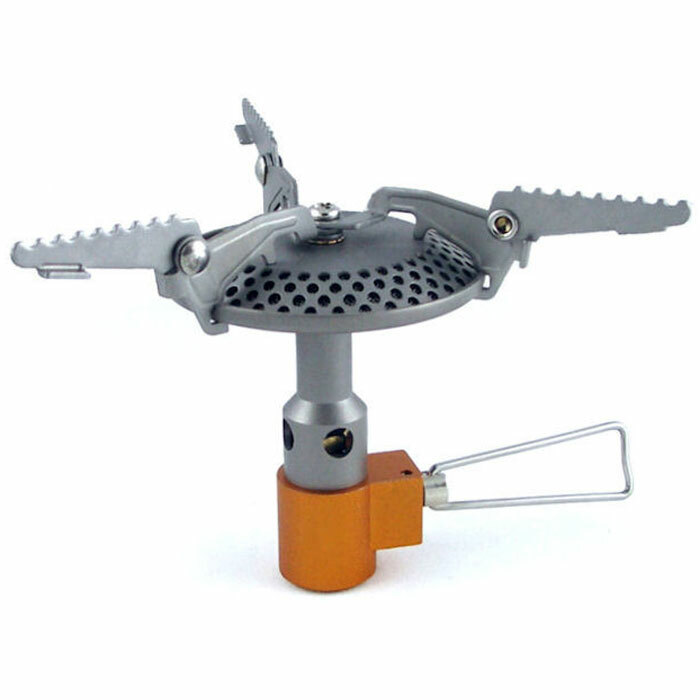 Badges, Stinking Badges: By all accounts, the Gnat was actually manufactured by Fire Maple in China, who markets the same stove as the FMS-116t Titanium Stove. 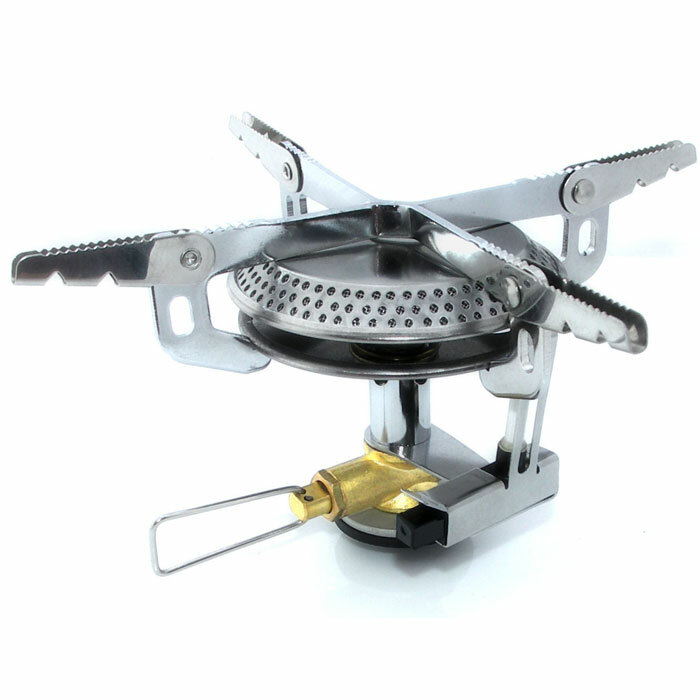 Others who have put their badges on the FMS-116Y appear to be Olicamp’s Kinetic Ultra Titanium Stove, and GoSystem’s Fly. Specs: The manufacturer claims the Gnat weighs 48g/1.69 ounces. Mine weighs 47g on my scale. I’ve seen claims of 11,000 BTU on the Monatauk Europe site, and on several reviews, but the Fire Maple site specs 2820W / 9,620 BTU. Boil Time is a claimed 3 min 30 seconds. Nielsen Brown, on Nielsen Brown Outdoors found the Gnat used 20 gms of gas per litre of water boiled. Mac E on Stayin’ Alive found that the GoSystem Fly used 11g of gas and took 4 mins 18 secs to bring 500ml to 99°c with a 1/3 filled canister. First run: I weighed my canister at 139g, screwed my stove on snugly, and got 500ml of water to 68 degrees in my Snow Peak Trek 700 Ti pot. I started my stove and my stopwatch and set the flame at the setting I usually use, with the flame just lapping at the edge of the pot. I monitored water temp with a digital cooking thermometer. It hit 212 degrees at 6:21 minutes. The canister weighed 131g, so I used 8g of fuel at that setting. Second run: Got a second 500ml of water to 68 degrees, and cranked the stove to wide open throttle. It hit 212 degrees in 3:30 on the nose! The canister weighed 122g, so I ended up using an extra gram to save 2:51. Support: As soon as I purchased my Gnat, I started looking for a maint kit. Or at least a replacement o-ring. I found nothing, and got no response my emails to Monatauk. Couple of years later, I can’t find them at any vendor, tho Liberty Mountain did offer to hook me up. I got mine from McMaster-Carr. Prod# 2857T117 - Viton Etp Fluoroelastomer O-Ring, AS568A, 5pk. On the other hand, I couldn’t find one on eBay, so it appears those of us who own them, are keeping them. Availability: As of this writing, Fire Maple’s FMS-116t, Olicamp’s Kinetic Ultra, and GoSystem’s Fly are all available online. Get 'em while you can! You are putting out some great reviews! Thank you! I second what Goose said. Great reviews! Thanks for sharing them. Just fabulous! Extremely lightweight, simple, practical and it works! 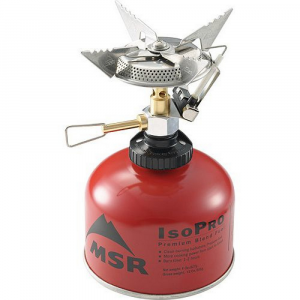 I was just looking for a lightweight stove because the one that had weighed 10.5oz. Well, I was attracted by the marketing Monatauk on the Gnat: The lightest in the World! The marketing does justice to the product, after all it only weighs 1.6oz. Constructed in titanium, the durability is good as well. 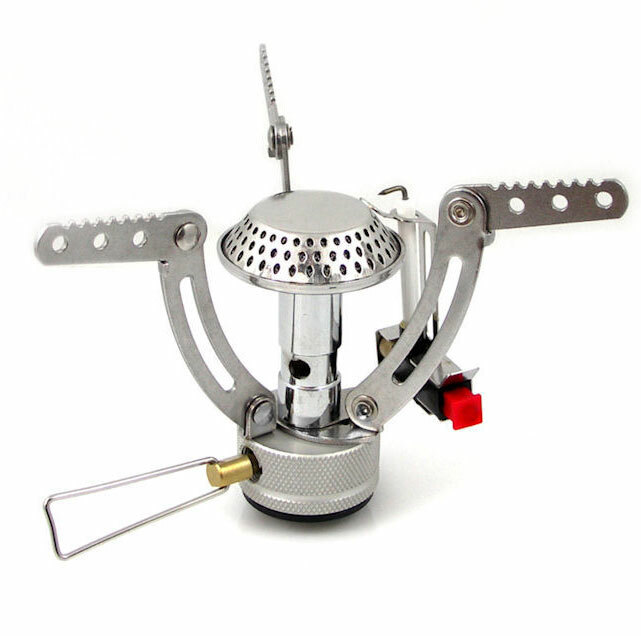 Has an excellent distribution of the flame, it covers the entire bottom of pot. The flame is not concentrated as the previous stove I had. Very easy to disassemble it for cleaning and possible replacement of components such as O-ring. Just make sure you use it out of the wind or use a clipper wind. Today, my kitchen set with titanium pot and spork and a collapsible rubber mug, only weighs 10.22oz (lighter than my previous cooker)! PS. : I'm from Brazil, so my English is not so good, sorry! 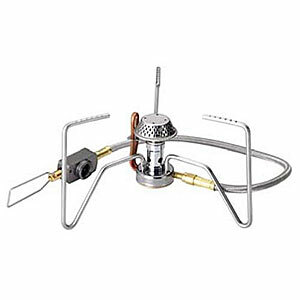 The Monatauk Gnat Titanium Stove is not available from the stores we monitor. It was last seen November 5, 2013	at CampSaver.com.